Jessticulates: Review | My True Love Gave to Me | Twelve Days of Christmas! Review | My True Love Gave to Me | Twelve Days of Christmas! A collection of joyful festive stories that will keep you warm during the cold winter months On the first day of Christmas, my true love gave to me ...This beautiful collection features twelve gorgeously romantic stories set during the festive period, by some of the most talented and exciting YA authors writing today. The stories are filled with the magic of first love and the magic of the holidays. 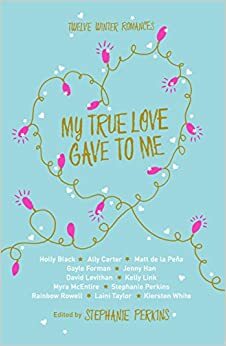 Includes: Ally Carter; Holly Black; Laini Taylor; Rainbow Rowell; Matt de la Pena; David Levithan; Stephanie Perkins; Kiersten White; Kelly Link; Jenny Han; Gayle Forman; Myra McEntire. I was going to post one of my normal reviews today and talk about the book as a whole, but after reading Shannon's review over at It Starts at Midnight I just had to look at each story individually purely because I felt quite differently to Shannon about quite a few stories. That's the beauty of anthologies - there's something for everyone! Midnights by Rainbow Rowell: As can be expected from a Rowell story, this was a lot of fun and a really easy read. Rowell has the kind of writing style that makes it easy to slip into the lives of any of her characters, but while I enjoyed this story it wasn't my favourite; I loved the relationship between the two characters and I loved the idea behind the plot, but Noel annoyed me just a little bit. There's just something about a guy who complains about losing a girl he likes, despite overtly kissing other girls in front of her, that annoys me. I get none of those kisses were supposed to be serious and the story was supposed to be more about Mags seizing the moment, but as a girl who's been through a similar situation I felt sorry for her and Noel made me a teensy bit mad because of it. The Lady and the Fox by Kelly Link: I've never read any Kelly Link before, and I LOVED this story. When I looked her up I discovered that short stories are her speciality, so now I'd love to read some of her collections. I have a weakness for magical realism, and this story had plenty of that. I did find parts of it a little confusing and it might have been nice to have some things explained to me a little more clearly, but I'm pretty sure I understood everything and, for a short story, Link certainly managed to flesh out a lot. Definitely one of my favourites in the anthology. Angels in the Snow by Matt de la Peña: I don't know if I've ever read a story with a Mexican protagonist, and for that I'm both really mad at myself and really pleased that I can now say I have. Like Midnights, I enjoyed this story; it was cute, and I really liked the setting of two people alone in an apartment block over Christmas. It wasn't one of my favourites, though. I liked Shy - he felt like a very raw, honest character - but I couldn't quite connect to Haley. Still an enjoyable read, though! Polaris Is Where You'll Find Me by Jenny Han: This story is the main reason I decided to review each individual story, because while Shannon didn't like it as much as the others, I absolutely loved this one! In fact I think this one might be my favourite out of the twelve. I never knew how much I wanted a story about a girl raised by Santa until now, and I loved that the protagonist of this story is another POC. I haven't read any Jenny Han before, her novels don't really sound like my kind of thing although I have heard great things about To All the Boys I've Loved Before, but honestly I'd love to see an entire novel about Natalie! It's A Yuletide Miracle, Charlie Brown by Stephanie Perkins: Yet another author I haven't read before now. I really enjoyed Perkins' writing style, and North is my kind of guy. I have a soft spot for the kinds of guys that can move furniture on their own, hence my love for Beast from His Fair Assassin and Shadow from American Gods. I loved the chemistry between Marigold and North - this one's another favourite! Your Temporary Santa by David Levithan: Not too long ago I was thinking how I want to read something David Levithan has written on his own. The only thing I'd read of his before now is Dash & Lily's Book of Dares (reviewed here), another Christmassy read, which he wrote alongside Rachel Cohn. This one wasn't one of my favourites. I didn't really connect to either of the characters, but it was great to see a homosexual relationship in the anthology! Krampuslauf by Holly Black: Before now the only thing I'd read of Holly Black's was The Coldest Girl in Cold Town (reviewed here) and I didn't like it all that much. Sadly I wasn't the biggest fan of Krampuslauf either. My problem with Holly Black is that I love her premises, but I always come away from her stories a little disappointed and I don't know why. I guess there's just something about her style that means she and I don't jam, which is a shame because I really wanted to like this one more than I did. What the Hell Have You Done, Sophie Roth? by Gayle Forman: I'm pleased to say that Forman is at least one author I have read before! I read If I Stay not too long ago and really enjoyed it, so I was looking forward to her story. This story was fun, but I didn't enjoy it quite as much as some of the others. Beer Buckets and Baby Jesus by Myra McEntire: This story was cute. It wasn't spectacular, but I did like that it surprised me; I thought the characters were all going to be very predictable, but some of them were a pleasant surprise. It wasn't one of my favourites, but it was fun. Welcome to Christmas, CA by Kiersten White: I didn't like this one. The main character and I just didn't get along, and what with her narrating the entire story it meant I didn't enjoy it as much as some of the other stories. Star of Bethlehem by Ally Carter: Wow, me and this story really didn't click. I think this one was my least favourite of the collection, but I'd still like to check out some Ally Carter's other work because Heist Society sounds like a lot of fun! The Girl Who Woke the Dreamer by Laini Taylor: I hadn't read any Laini Taylor before, and people weren't lying when they said her writing style is beautiful. I didn't love this story as much as some of the others in the collection, but for the way it was written alone - and for how different it was to the other stories - it deserves an extra point. If you've read My True Love Gave to Me I'd love to know which stories were your favourite! That's the last post of my Twelve Days of Christmas - have a very Merry Christmas!